I’ve probably mentioned this show a few times over the last few months, mainly whenever I am talking about a renai show, this is because it’s the product of the only notable production team that specialise good at making this sort of show. Kyoto Animation, while best known for series like Haruhi and Lucky star, also have a team that has been dedicated to adapting Key’s classic visual novels to anime form. They originally worked on Kanon, then did Air a while ago which is the first one that I watched. Haven’t seen Kanon yet actually, but probably will at some point soon. It’s also worth noting that they all have the exact same intro. So why should you watch any of these eh? Well they are bloody brilliant, if you must know. Oh, If only it were that easy to convince…. Anyway if I had to boil it down I would say that all of these shows are about a bloke and his interaction with some chicks. The bloke in question being Tomoya Okazaki, and the chicks in question being many of the girls at the high school he attends. Much of the show involves Tomoya becoming involved with the girls for various reasons, there’s also the token best friend character just to balance out all the girls. Main characters Nagia and Tomoyo, debating Nagisa’s astonishing lack of friends. Tomoya is a bit of a delinquent as demonstrated by his squint tie, and rarely attends school. He has a chance encounter with a girl called Nagisa who HAS NO FRIENDS. Of course a cute girl having no friends cannot stand in this generally upbeat sort of show, so they become friends and thus the problem is solved forever. Of course her problems continue in thatthat she has this odd desire to start a theatre club at school and put on a play that seems to be rattling around inside her head for some reason. To this end, Tomoya helps Nagisa try and recruit people into the theatre club, which is where most of the other characters come in. This inevitably results in them meeting all the schools odd-balls and other friendless weirdoes. Some of these characters go on to have their own arcs about their own set of horrible problems as well. The central theme of Clannad is family, so most of the characters have issues along this general line. Tomoya for example has an alcoholic and possibly abusive father who he despises and treats as a stranger. Nagisa has this odd feeling that she ruined her parents life at some point, but can’t quite remember the details. Another girl they meet is Kotomi who spends all day sitting in the library reading, and has absolutely no social skills whatsoever. One of the story arcs is devoted to trying to teach her how to be more normal, and yes, get over some of her pressing family issues! The show tends to be upbeat, definitely it is cheerier than Air ever was. According to Clannad, this is what a world that ended looks like. One of the main things that draws me to these Key/Kyoani shows is their odd ethereal tone. In Clannad this is mainly actioned by these odd sequences that seem to take in a “world that has ended” which is an odd desolate future in which exists only a girl and a mechanical/clockwork bear that she made out of sheer boredom. These sequences are obscenely well animated, and are inserted into the show seeming at random at least initially anyway. They are eventually worked into the main in a way that makes sense. It’s a nice juxtaposition between this and the relatively ordinary goings on of ordinary high school life anyway. This section eventually gets tied into the main story in a way that doesn’t seem totally crazy, which is always nice. Another element that characterises Key’s stories is slight supernatural elements. In Air, the main character could make a small doll walk around and perform little acts using his mind, but no-one ever seemed to think it was particularly interesting. Uh, also he became a crow at one point. 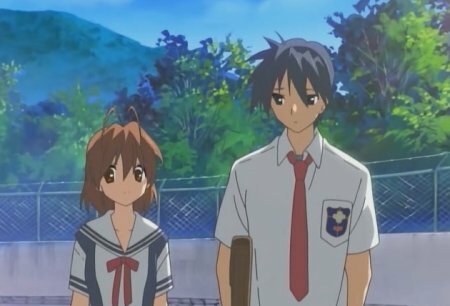 In Clannad, at some point the characters realise that one of their friends whom they hang around with every day is actually in a coma in a hospital one town over, which comes as quite a shock to them. This arc deals with them working out how the hell to handle such a situation. I found this the most enjoyable arcs in the show. To be honest, being main character in one of these shows is a pretty sweet deal. If you haven’t seen this sort of show before, I can imagine there would be a little reluctance given the evidence presented. They just don’t sound that interesting when described, and it’s hard to really pin down what makes them good. It’s not a comedy, though there are comedic elements. It’s not a mystery show but there are mysterious elements. It’s not a romance show but there are romantic elements, etc, etc. The main draw of the show is I guess it’s excellently likable characters, and good development of said likable characters. This is definitely a character centric show that I can get behind. If you had to start with one of these shows, this would probably be one of the better ones, though Kanon would also be an option. You aren’t going to see anything particularly badass (except a few scenes where the feisty sporty girl gets into fights), but you will receive a touching heart-warming sort of affair, and there’s still room for that sort of thing isn’t there? Hihi i got this one too… im still goin through it..
You say that you found the fuko arc from Clannad to be the most interesting, but you fail to mention Kanon in your post! Don’t you know that Ayu’s character from Kanon was developed far and beyond Fuko? In fact the whole Kanon story practialy revolved around that girl who was stuck in a coma. Now for the girl in a coma arc, Kanon was better.